They say if you go down to the crossroads alone, and wait for that brief moment when night turns to dawn, you might see the old man sitting there. Even if you don't see him you might smell the faint aroma of his pipe tobacco, or see the shadow of his crutch, or hear his deep merry chuckle. Sometimes he gives you things: sometimes he takes things from you. Only one thing is certain: once you've gone to see him, you'll never be the same again. Some say the old man is the devil himself: others say he's an angel sent from heaven, and still others call him the Lurker at the Threshold. If you ask him about this, he'll tell you "yes." And then he'll chuckle to himself, his eyes brighter than the waning stars as he puffs on his pipe and dawn becomes daybreak. The crossroads is the point where possibilities intersect, the point where we must make a choice. If we choose to travel down one path, we have also chosen not to travel on the other. The cosmology of various African tribes has always placed great importance on the crossroads, and on the meeting-points of heaven and earth. For them the cross did not represent the crucifixion, but the creation of the universe. At first glance, Legba appears like an unassuming old man. Accompanied only by his faithful dogs, he leans against his cane for support as he limps down the road. With nothing to his name but shabby clothes, a corncob pipe, and a straw bag, you might mistake him for a beggar. But when you are dealing with Legba, you must remember that appearances can be deceiving. The cane he leans against is actually the poto mitan, the gateway between heaven and earth by which the Lwa enter ceremonies. He limps not because he is crippled but because his feet are in different worlds--the material kingdom and the land of spirit. Legba is the first one saluted at any Vodou ceremony. Since he is the keeper of the gateway, no spirit can enter the peristyle without his permission. He is the one who facilitates communication with the spirit world. Houngans and Mambos say that Legba knows all the languages of man and gods. He is the one who brings our messages to God and to the other lwa . . . and the one who brings their responses to us. In this he resembles the Greek Hermes . . . and, like the Greek Hermes, he can be a trickster. We must remember that Legba is the Great Communicator, but also the Great Miscommunicator. He is fond of riddles, paradox and ambiguity. He allows us to speak with the gods, but often plays tricks with their messages. He gives diviners a glimpse into the future, knowing full well they will misinterpret his statements. In yet another of the paradoxes so beloved by Legba, he governs both destiny and uncertainty. Legba does not demand a lot from those who serve him. An occasional cup of black coffee, some grilled corn or peanuts, and a little tobacco for his corncob pipe will make him happy. Other offerings which he may like include cane syrup, palm oil, plantains, salt cod, yams, gin, rum, and cassava bread. To warm his old bones, you may want to add a liberal sprinkling of cayenne to his food. You can use an image of St. Lazarus to represent Legba: they are readily available in most Haitian and Cuban Botanicas. You can also represent him with a scarf of the appropriate color, or with his vévé. Before you honor any other lwa, you must honor Legba. This doesn't have to be fancy, elaborate or drawn-out. All you need do is sprinkle a few drops of cane syrup or some other drink of his choice on the ground, give him a cup of coffee or some roasted corn, or even say "Legba, please open the door for me. You remember me: I gave you [offering] on Monday [or whenever else you fed Legba]." When you do this, you ensure that he will "open the door" and let the other spirits through. If you forget to do this, he will not bring your offerings to the other lwa until you've provided him with appropriate payment and respect. Legba is not difficult to please. If you give him some spare change, some peanuts or candy, a bag in which he can keep his belongings, or a crutch to help him along his way he will generally be satisfied. Of course, if he does something really special for you, you can reciprocate in kind: give him a nice statue, or have a Houngan or Mambo prepare him a "Makout Legba," a special bag that contains his things and which has been activated by ceremonial means. If you can, you may want to keep a shrine to Legba by your door. He will guard the gate and bring you good fortune, while sending bad things elsewhere. Before you ask Legba for any favors, remember that he has a keen sense of humor and loves taking you by surprise. When he comes through for you, it's likely to be in a totally unexpected and surprising way. He may even make you feel like a fool on occasion. If this happens, the best thing to do is laugh with him and learn from the experience. "Refreshingly original, well-documented, and just plain fun. Kenaz brings just the right combination of insider insights and skeptical observations to this must-read for anyone fascinated by the world of Afro-diasporan religious movements. Highly recommended." “Filan's clear and sensible approach shares the rudiments of Vodou, and gives us a fascinating introduction to the history and culture of Haiti. This book will be important to all who feel that religious practice makes a practical difference in our lives." "Vodou is not what most people think. It's not "devil worship, dark curses, and drumbeat-driven orgies performed at midnight," poking needles at dolls, or simple superstition. With over a decade of service to the lwa (the deities of Vodou) and membership in Société la Belle Venus #2, a Vodou temple in Brooklyn, Filan sets out to right these pulpy perspectives of what in reality is a complex African diaspora spirituality and a form of worship that marries the secular and the spiritual. Of course, Vodou is not without its dangers, since "the lwa can wreak a frightening vengeance." It's not foolproof, either; without proper initiation into addressing the lwa, they will simply ignore you. But Filan aspires to give potential initiates the proper tools for communicating with the deities of Vodou (like Mama Danto who protects, and Papa Damballah who brings peace). In the process, he shares the rich and at times disturbing history of its practitioners (especially the oppression and racism faced during slavery), and offers a litany of everything necessary to practice Vodou on an individual level, from knowledge of the tradition's most important symbols, rites, myths and spells, to an extensive list of further resources and Vodou-related Web sites, music and even charities." "There is a sense of excitement which runs through this book, and the reader is caught up in its facts and material in an enjoyable manner. This is a good reading experience about what Haitian Vodou truly is, with nothing left out." "This book made me think. And because it did, I give it my highest recommendation. Great for anyone who has an interest in this subject." "Kenaz Filan has succeeded where many before have failed. 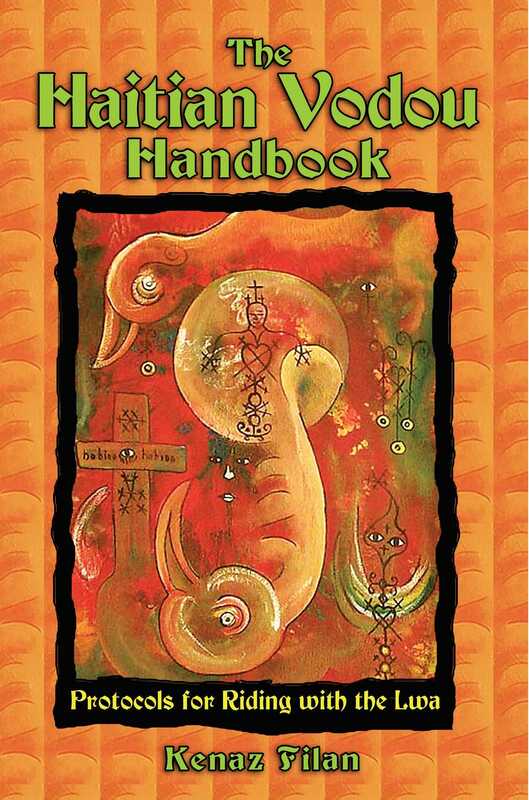 The Haitian Vodou Handbook (emphasis on the “handbook”) is a highly practical and informative starter’s guide. . . . Filan's book provides all the necessary information, and then some, to get one started in serving the Lwa. For those wishing to continue their exploration of the subject, the author provides extensive references and pointers to sources of information, internet resources and suppliers. "I wasn't sure what to expect when I got this book, but I was very pleased with it, even the parts I disagreed with. It is informative, well-written, and well worth the price." "This is an excellent introductory text for folks of any background. . . . honest and respectful, and has a good balance of information and respecting of oathbound material. If you've any interest in this religion whatsoever, even just curiosity, this is a great place to start."